In 2016, Kelly Brock, a reservation coordinator for Hallmark’s attractions, and member of Hallmark’s Military Interest Group (MIG), reached out to her father-in-law’s USS Hornet organization with an idea. 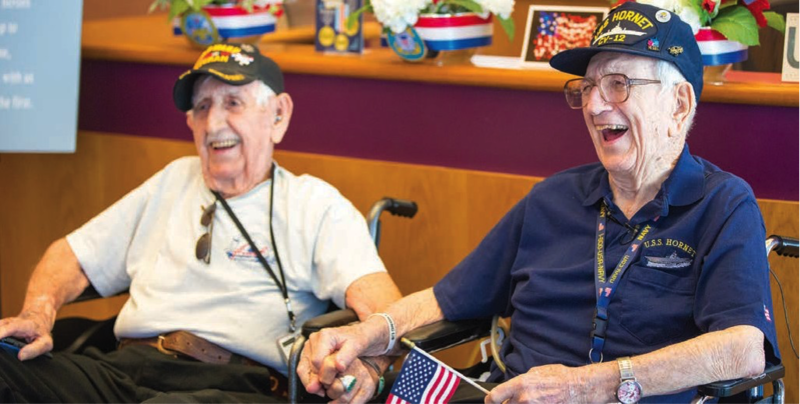 The Hornet’s members — veterans who served in the Pacific War, World War II, and the Vietnam War were looking for a location to host their annual reunion the next year. Brock suggested they visit Kansas City and tour the Hallmark Visitors Center, where the staff would create a special military display in their honor. Once the group confirmed they were coming, Brock wanted to ensure the veterans felt the Hallmark spirit at the Visitors Center. On a bright, sunny September day, hundreds of Hallmark employees holding signs and waving American flags welcomed 60 USS Hornet veterans and their family members with a rousing patriotic welcome — a reception many never experienced when returning home after serving their country. “It was the second-most touching thing I’ve had happen to me in my 94 years,” said Ken Brock, Kelly Brock’s father-in-law and World War II veteran. Shawn Clark, senior logistics planner, veteran and MIG chair, also coordinated a card-signing opportunity for Hallmark employees during the rally. The Hallmark cards with more than 1,000 signatures were shared with Kansas City and Heartland Honor Flight veterans. Hallmark employees also brought holiday cheer to the USS America, a naval ship on the last leg of a seven-month deployment, at the end of last year. Diane Goode, project coordinator, Hallmark Greetings, reached out to the MIG on behalf of her son, a master sergeant with the U.S. Marine Corp.
Hallmark employees collected 700 ornaments in just four days to decorate the empty Christmas trees in the USS America's dining room. "It certainly wouldn't have happened without fellow Hallmark employees' kindness and enthusiasm, and I think a little divine intervention," said Goode. Employees on the diversity and inclusion team at Hallmark’s Metamora, Illinois, facility selected Goodwill Industries as an outside organization for support. The Stand Down for Homeless Veterans event hosted by Goodwill offers 200 veterans a hot meal, clothing for winter, educational seminars and basic medical services. Seventy-five employees collected 350 pounds of clothing for the event as well as outside donations. “Our team sees the highest participation rate among facility employees when hosting events to support our veterans,” said Bryant Carter, plant systems analyst, Hallmark Metamora facility.